Visit us in Altamonte Springs, FL to determine if porcelain veneers are right for you. Porcelain veneers can be used to address a range of dental concerns. Dr. Clay Miller, Dr. Kirk Solberg, and Dr. Mark Williams are highly trained cosmetic dentists who can work with you to find the right solution for your oral health concerns. Whether you need minor tooth damage addressed or a smile makeover, porcelain veneers can help you achieve the smile of your dreams. If you have any questions about cosmetic dentistry, or you would like to determine if porcelain veneers are right for your smile, visit our Altamonte Springs dental practice. Porcelain veneers are thin, ceramic shells that are permanently bonded to the teeth. Porcelain veneers are natural looking, long-lasting solution for a wide range of oral and cosmetic dental concerns. What issues can porcelain veneers address? What happens during the porcelain veneer process? Your Altamonte Springs dentist will remove a small amount of surface structure form the affected tooth. Molds of your teeth are taken and sent to a dental lab for fabrication. Your dentist will color match your porcelain veneers to match seamlessly with your natural teeth. 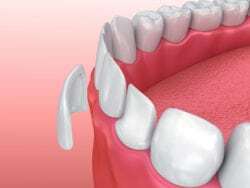 Once your porcelain veneers are completed, your dentist will ensure a quality result and permanently secure your porcelain veneers to your teeth. How do I schedule a consultation? If you are searching for a solution to transform your smile, consider porcelain veneers. Our team at Solberg & Miller Dentistry in Altamonte Springs, FL can work with you to help you choose the best solution for your dental needs. To schedule an appointment, call (407) 636-2402 or schedule an appointment online.